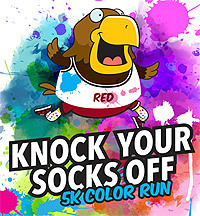 REDDING, Calif. - Simpson University will host a “Knock Your Socks Off” 5K color splash run from 10 a.m. to 2 p.m. Saturday, Feb. 14, as part of its homecoming week activities. Check-in starts at 9:30 a.m. Runners are encouraged to dress in crazy socks and wear white shirts for the color splashing (cornstarch and food coloring) that will take place along the route through campus. Prizes will be awarded following the race. All proceeds will be donated to the university’s WorldSERVE program for student mission trips. The cost is $5 for current Simpson students; $7 for individual racers; and $28 for a team of four. Runners are invited to stay for a tailgate party from 3 to 6 p.m. that features a food truck court, carnival booths, a dunk tank, jump houses, climbing wall, and more. The Red Hawks women’s and men’s basketball teams will play Menlo College at 5 and 7 p.m., respectively. Simpson University is located at 2211 College View Drive.